It’s not an uncommon sight as you’re scrolling through your Facebook news feed: a friend shares a heartbreaking photo, accompanied by a post that pleads with users to “like,” “comment” or “share” in order to raise money or awareness for a person in need. A baby with a cancerous tumor, a teen on a ventilator — these posts take various forms. But Facebook users need to be cautious, as some of the emotional posts they’re reading may not always be true. In fact, there’s a chance they’re part of a scam called “like-farming” that could put your personal data or computer security at risk. The Better Business Bureau (BBB) warned about the scam, which lures people into liking or sharing a fake page by claiming Facebook will donate a given sum of money for each action, back in 2015. And now, their warning is being shared anew as fake posts once again go viral. Scammers who use “like-farming” tactics can take advantage of a Facebook user’s interaction to either collect and sell information about that user or use it as a gateway to collecting more personal information — like passwords or credit card numbers. A recent story that was circulating on Facebook, involving a 3-year-old boy, thrust the scam back into the spotlight last week. The post, which claimed the young boy had “cancer” and “needs surgery,” garnered more than 2.1 million shares and nearly 300,000 likes — until it was finally removed for violating Facebook’s terms of service. Sarah Allen, from St Neots, Cambridgeshire, in the U.K., told the BBC that the scammers stole photos of her son, Jasper, and made up the story about cancer. 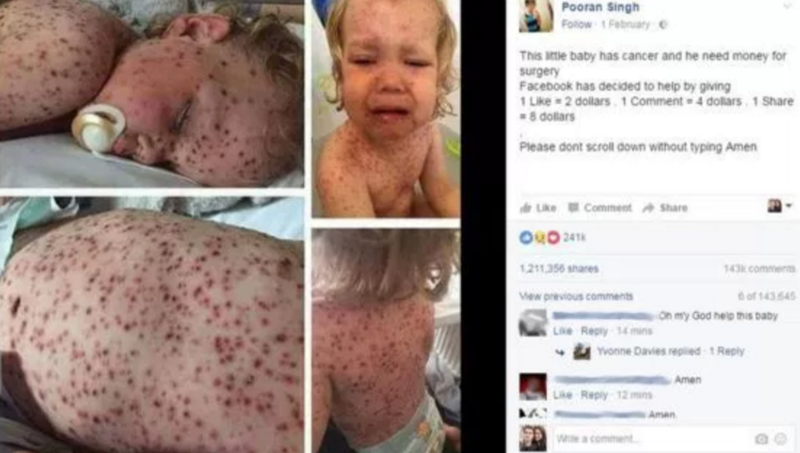 In reality, Allen said her son had severe chickenpox when the photo was taken back in August, and she only made the photos public to call on the government to make the chickenpox vaccine free. Facebook confirmed to CBS News that any posts using Allen’s photos have been removed. They claim someone has cancer or another serious disease and needs money for surgery. They typically ask a Facebook user to comment “Amen” at the end of the post. So, next time you see a post with a heart-wrenching photo that catches your eye, look for these signs before responding. And if you suspect the post is a scam, report it to Facebook immediately.